Tomorrow I'm gonna pull apart the front end and pressure wash the hell out of the condenser. If it still overheats then im gonna stick a fan on the other side of the condenser and see if that changes anything. I guess at that point we can rule out air flow. Ill bleed the system again. 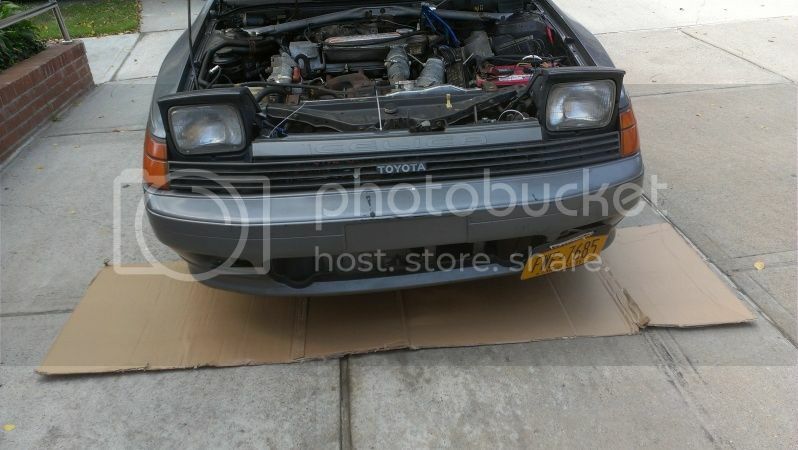 Next step will be a tstat from a parts store just to test with until my toyota tstat gets here. So ill post those results tomorrow evening and see what happens. Yep we will see what this afternoon brings. I'm getting ready to bleed brakes and change gear oil on my 02 WRX. After that its on to the alltrac. The issue is that when the engine is hot enough it will boil the coolant and can overwhelm the coolant overflow. Once that has dumped coolant out it will eventually cool and the vacuum of the system will draw what coolant remains back in. The trouble is after a few cycles of this it will draw in air and that is where issues begin. Advice hear is to use a slightly higher percentage of water in the cooling system as water transports heat better than coolant. Next to keep the water from boiling, or expanding as much when it does boil- use Redline WaterWetter. The stuff works very well and I've been using it for years. Finally consider a turbo timer if you are too lazy to let the car idle when shutting it down. I've been dealing with similar troubles on my ST165 and feel I have a fairly good solution. viewtopic.php?f=44&t=43563&start=60#p421897 If you take a close look at the lower and upper grille openings, you will see that there are many areas for air to go around the radiator as opposed to passing through it. Nor is there much to keep the air from washing through the sides of the radiator. Note that air will flow from high pressure to low pressure and that there is a large high pressure zone in front of the car. Additionally, with the high pressure zone in front of the radiator we need to ensure that the pressure is lower behind it so that air will pass through efficiently. So there are a few major hurtles to overcome. My solution addressed airflow to the radiator and the pressure zones on either side of it. Firstly, the aluminum panels that closely fit to the bumper support and core support. These surround the radiator and prevent air from washing over the top and sides of the unit. For air passing underneath there is the lower 'scoop' that mates with the bumper grille and directs air to the radiator. Turns out I never actually put a picture of the finished product but you can get the basic idea. As for the pressure zones, the splitter does a few things here. viewtopic.php?f=44&t=43563&start=75#p422151 First it creates a high pressure zone above the panel and directs air to the vents above it. Next it keeps the air that passes below it smooth and laminar. This creates a lower pressure zone behind the panel, which helps to suction air out of the engine bay. This effect is greater with speed, and to address lower speeds is where the vents come into action. Heat naturally rises and the vents help bleed off extra heat from the engine bay decently at lower speeds. 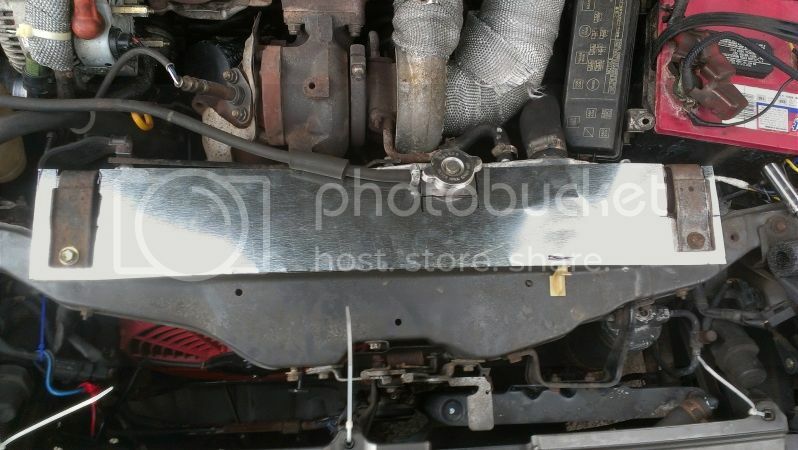 Oh- nearly forgot to mention- get some foam weather stripping to seal the entire radiator to the core support. There are many large gaps that allow air to escape around the radiator. This effectively makes the pusher fan in front of the condenser useless unless the air spillways are addressed. In either case I hope this gives you some insights to the cooling system and areas that it needs improvement. - Remove some coolant and mix in some water. I already put one bottle of water wetter, should I put another? - I should source the second coolant bottle and add that in as well. This will allow extra coolant capacity preventing coolant from flowing out of the tanks? - I currently have a 0.9 cap on the radiator will the 1.1 make much of a difference? ZeroDrift wrote: The issue is that when the engine is hot enough it will boil the coolant and can overwhelm the coolant overflow. Once that has dumped coolant out it will eventually cool and the vacuum of the system will draw what coolant remains back in. The trouble is after a few cycles of this it will draw in air and that is where issues begin. Advice hear is to use a slightly higher percentage of water in the cooling system as water transports heat better than coolant. Next to keep the water from boiling, or expanding as much when it does boil- use Redline WaterWetter. The stuff works very well and I've been using it for years. Finally consider a turbo timer if you are too lazy to let the car idle when shutting it down. If you have WaterWetter in the system, one should be enough. As for the higher pressure radiator cap- I would advise it. While it does add some level of strain to any gaskets, it also effectively increases the boiling point of the system. Not sure if you honestly need a larger overflow tank. Try this as a last resort. Essentially all of these small items add up to a system that will cool properly and provide better temperature stability for your engine. The UK guys are big believers in the high pressure radiator cap. I would tend to agree with them. You should be running 50% water or possibly even more (I run 70% water or so, but my car doesn't spend much time below freezing). Water is a better 'coolant' (meaning heat capacity, ability to remove heat from the engine), but the coolant itself will aid in lower freezing point and a higher boiling point. The coolant I use is the prestone 50/50 mix stuff. I haven't heard anything bad about it. Same thing I use in the WRX as well. If I put the AC on I noticed it takes longer for it to start getting past the halfway point so I guess its getting better slowly. I'm going to switch over to the 1.1 radiator cap as well. Today I had so free time so I decided to start working on those templates. One for the radiator shroud, which is similar to what beatrush makes for the WRX. Constructive critisicm is welcome!!! 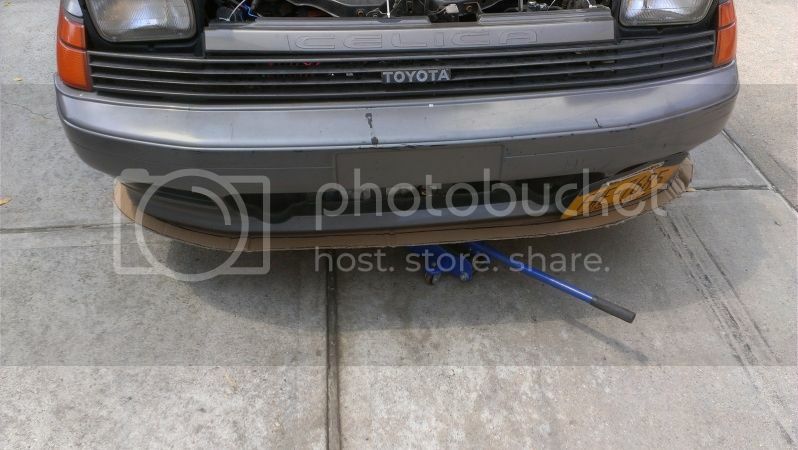 For the air splitter I gave it about 1.5 inches out from the bumper. More trimmed - Red tape indicates where I will have to bend to get it to fit correctly. Stainless Steel sharpie. Don't leave home without it!! Curry wrote: The coolant I use is the prestone 50/50 mix stuff. I haven't heard anything bad about it. Same thing I use in the WRX as well. I use the standard pre-mixed stuff + water on my WRX, but I use the Toyota Red on my 3s-gte. Hopefully the overheating stuff was just a bubble or whatever. Progress is looking good. 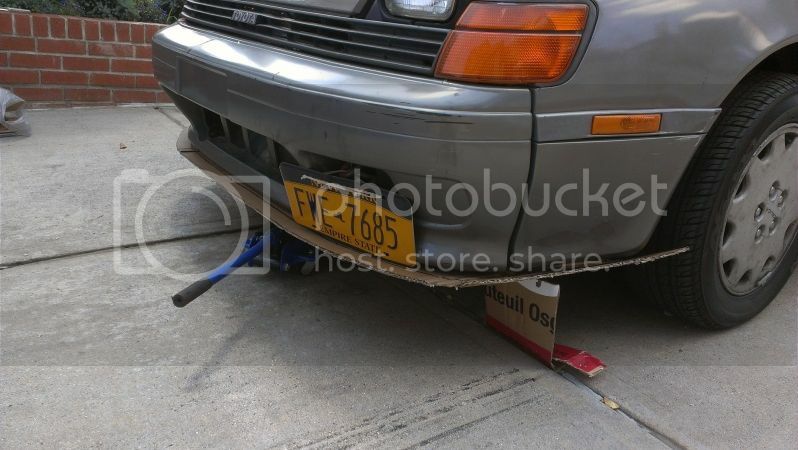 Tips on the splitter- use the lower tow mounts to attach a bracket. Very simple and sturdy piece to modify. 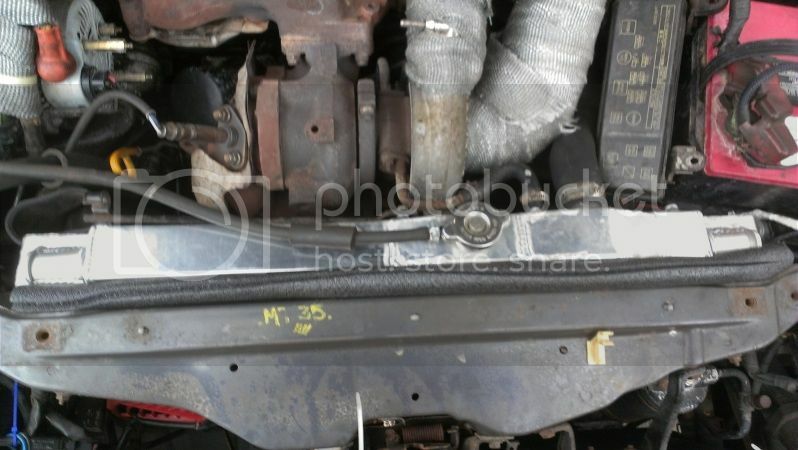 Don't forget about a duct for the alternator inlet if you still have one. 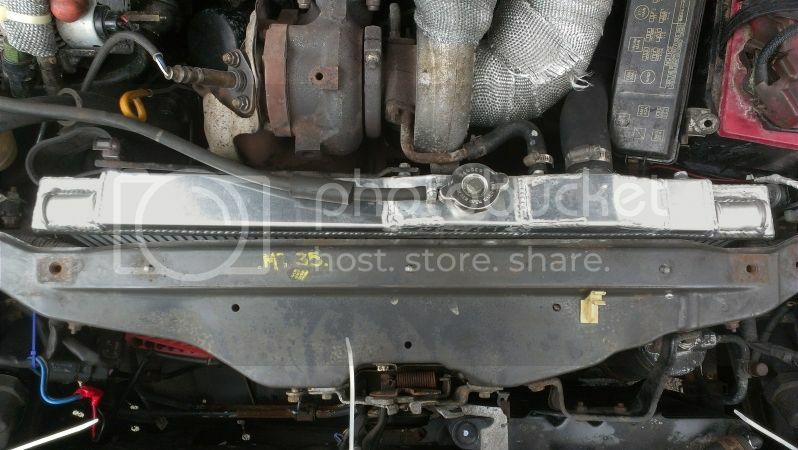 The shroud piece isn't needed as much there as compared to the area infront of the core support to the grille. Foam to seal the hood to the core support and another piece to seal the radiator to the core support will be more simple. A more critical piece is the lower section to guide air up to the radiator from the lower grille opening. 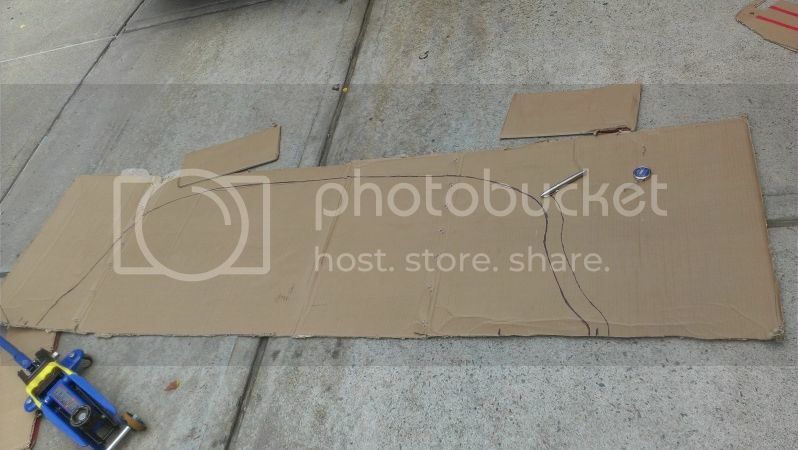 I think it's more important to fill the space between where you have the cardboard and the front bumper, most cars have a plastic panel that covers that gap and prevent air from flowing over the rad. Thanks for the feedback guys. Much appreciated. I'm still putting the foam to seal up the top gap by the radiator. I might still make the shroud to go over it just for kicks. Just curious to see how it will come out. Thanks Zero, I havent gotten to actually go under the car yet but I will post up if I run into issues getting the mounts done. I do still have the alt ducting so i will incorporate that as well. So are you guys saying a shroud to cover the gap between the hood latch and the grill is beneficial? Ok so I finally went to home depot and got my supplies. I started with the easy project. I sealed the top radiator gap. I hope I sealed the right thing. here are some pics. Let me know if i did it correctly! I decided to add the shroud cause it looks cool and it should keep the insulation in place. 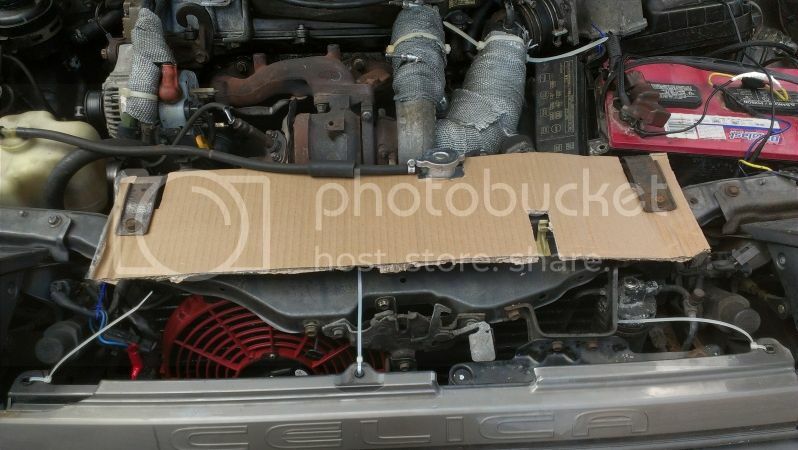 Tomorrow im going to do the sides and bottom with the same foam insulation and then I wanted to mock up a FMIC to see how thats going to affect the air flow mods im working on currently. I also have enough metal left over to start that air guide that goes on the bottom connecting to the bumper. 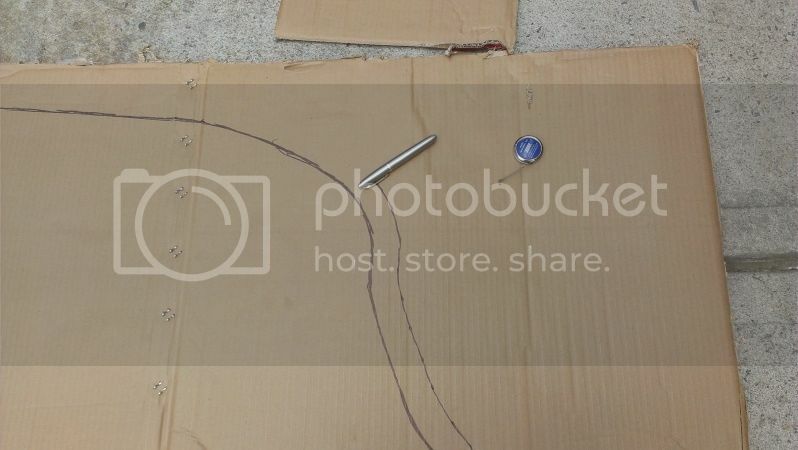 And finally I will get started on the actual splitter now that I have a template. 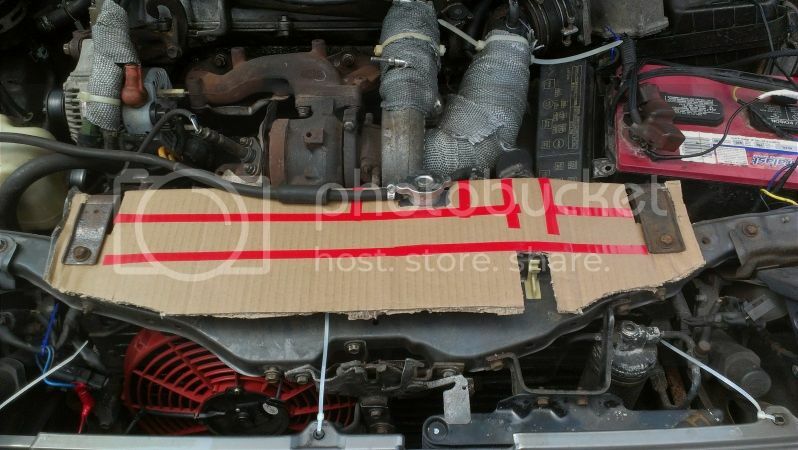 Curry wrote: So are you guys saying a shroud to cover the gap between the hood latch and the grill is beneficial? Yes, it's called a "cooling diversion panel" and forces the air through the rad vs over it. Ahhh ok I wasn't sure. Looks easy enough to make. I'll give it shot on friday. Raining here right now.